The Honey Dust is a kissable, moisture-wicking body powder that leaves the skin silky-soft and delicately scented, which is offered by Kama Sutra since a couple of years already. The Honey Dust includes a feather applicator. The Honey Dust can be used as a foreplay product by using the feather applicator to dust the powder onto the body of a loved one, followed by kisses. 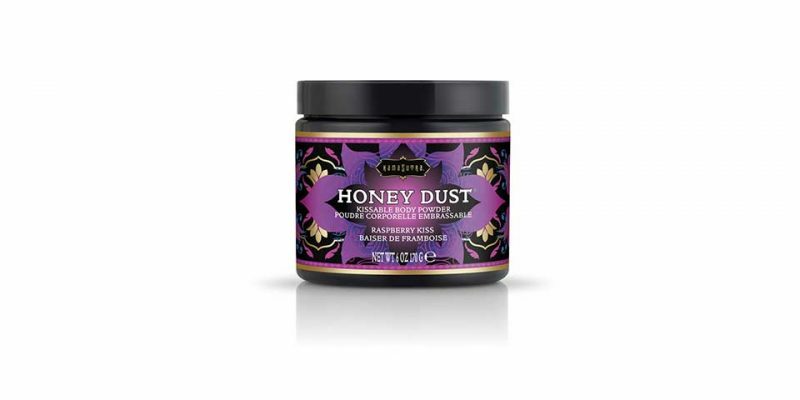 Honey Dust can also be used as part of your customers daily regimen. Dust onto the body before dressing and stay cool and dry all day love. Or it can even be used as a dry shampoo by massaging it into dry hair at the roots – leaving it clean and volumized. The Honey Dust comes in six flavours: sweet honeysuckle, raspberry kiss, strawberry dreams, vanilla créme, coconut pineapple, and tropical mango.